In Floris, the players rival for building the most sympathetic arrangements of flowers from the available cards – but which flowers to take and which arrangements to be made from them follows strict form. Like everything among the blue-blooded. Five cards are placed on the table face-up in an X-pattern (or the 5 on a die, if you prefer) called the ‘market’, the remaining cards form the face-down stack. Upon their turn, a player has to draw cards from the market – or from in front of another player (suspense…! to be revealed later). If a player takes cards currently in front of another player, they may take either one or two but all must be from the same player. In addition to the above, players can always take as many cards as they want from what is face-up in front of them – in NO case, however, can they put a card from their hand on the table in front of them. Now, why would you put cards in front of you when these are subject to flower theft? Surely that is a hand card limit thing? Nope. 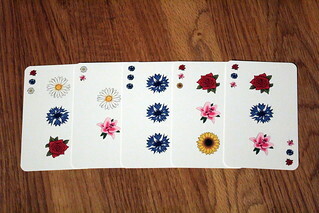 The catch is that when you arrange flowers, you need to use ALL the cards currently in your hand. So one extra rose can mess things up at least as much as that missing lily! There is a way to shed cards from your hand, but to a personal discard which counts as negative points come game end. 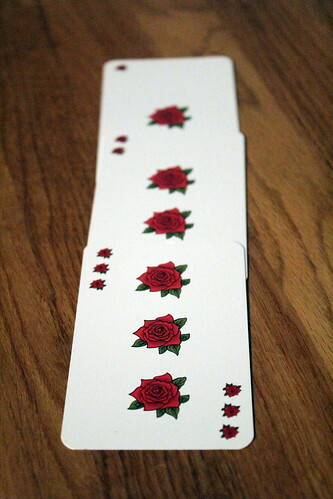 Therefore, you want to control your hand well to form nice bunches, even at the risk of losing cards you took. Once you have managed to collect blossoms forming a bouquet, you can either wait around or play your bouquet. This is placed in front of you, and you can start collecting for the next one. The game ends when the market can no longer be refreshed from the stack, which is when you officially score your arrangements. Minus points are awarded for all blossoms still in your hand at the end of the game (as well as those on your personal discard pile) – cards face-up in front of you don’t figure. Floris is a quick, nice little card game with some mind-twisting quality. While the rules are straightforward enough, figuring out which blossoms you still need to complete those ascending steps is in reality a pretty brain-bending thing. We are not talking SET or Logan Stones yet – but it IS not easy all the time. Particularly with other players messing up your plans even more. There is one small spot of criticism worth mentioning: Floris feels very different depending on the number of players. With two players, there is much more tactical variation than with four and you’ll be making bouquets of all sizes to win. 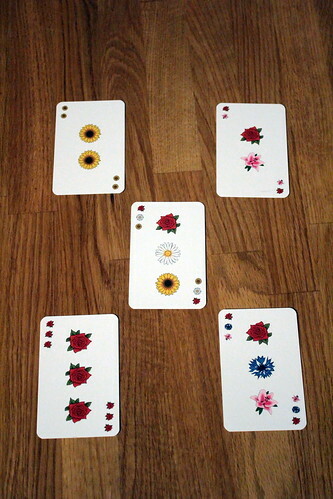 In four players, you mostly manage two large bouquets for points and then go into damage control mode, keeping your hand as small as possible for the game end. Additional cards to use only in larger games would have been a great addition here. Nevertheless, Floris is fun with any number of players. It’s not a game you will plan your evening around, but if you look for a filler or icebreaker with a bit of brains, Floris will do the trick – and do it nicely, too. You will have fun. A bunch of it, actually!